Rhinoplasty is an operation to alter the external appearance of the nose as well as to improve the function of the nose. Patients undergo rhinoplasty for various reasons, and this can range from a need to correct deformity due to previous injury or trauma, congenital malformations, functional issues affecting their breathing, or for enhancing the aesthetic appearance of their nose. Rhinoplasty can be considered if you have concerns with the breathing function of your nose and/or the external appearance of your nose and it has come to a stage where you are prepared to do something about it. Children should wait till their facial growth is near complete (late teens) and adults should not have any more pressing medical issues if they are conisdering rhinoplasty. In Singapore, insurance does not generally cover surgery that is purely for cosmetic reasons. Any component of the surgery aimed at improving nasal function or correcting any traumatic nasal deformity may be partly or entirely reimbursable. Discussion with your surgeon and your insurance carrier will help determine your eligibility. Nevertheless, if you are considering functional surgery like a septoplasty and have concerns regarding the external appearance of your nose, it would be best if these were addressed in the same setting because precious graft material would have been lost should you perform the procedure separately. Regardless of whether the surgery is desired for functional or cosmetic reasons, your choice of a qualified surgeon is of paramount importance. Singapore ENT Surgeons who are trained in ear, nose, throat, and facial plastic surgery, provide you, the patient, with the highest level of training and expertise. Rhinoplasty can be performed for functional or aesthetic reasons. Functional rhinoplasty is typically to improve the nasal airway and relieve nasal obstruction (blocked nose). Aesthetic or cosmetic rhinoplasty is purely to enhance the appearance of the nose. Often the apearance and function of the nose are of concern to the patient because form follows function and therefore a large majority of rhinoplasties are both functional and aesthetic. Rhinoplasty can be performed “Closed” where all the incisions are made inside the nose, or “Open” where an incision is made in the area of skin separating the nostrils. The choice of “Open” or “Closed” rhinoplasty depends on patient factors and type and extent of correction required. Being trained in both techniques, our doctors will be able to offer you the most comprehensive explanation for the ideal technique suited to your concerns. In Asian versus Caucasian rhinoplasty, due to differences in anatomy, techniques used differ somewhat between the two. Asian noses tend to require more augmentation and improved definition whereas Caucasian noses tend to require refinement and reduction. Having been trained with the techniques used in both Caucasian and Asian rhinoplasty, our ENT doctors are able to address the specific concerns and deficiencies that may be present in an Asian or Caucasian nose. Pertaining to Asian rhinoplasty, patients can choose between different types of implant material for nasal augmentation. While the preference would be for autologous (patient’s own) tissue, other options available include synthetic implants (Silicon, Medpore®, Goretex®), homologous (from donor)tissue (Alloderm®, Tutoplast®). Otolaryngologist will be able to discuss with you the most suitable options for your needs. You can expect a thorough evaluation of both the inside and outside of your nose before your rhinoplasty and any concomitant sinus or nasal septal issues can be addressed at the same sitting. The surgeon will take photographs of you and discuss the options available. Occasionally, additional procedures may be recommended to enhance the effect of your rhinoplasty. This may include chin augmentation (genioplasty) to bring “balance” to the face. 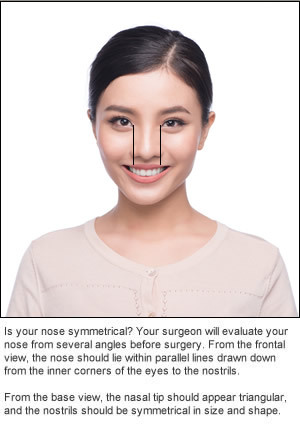 Rhinoplasty in Singapore, is generally performed under general anaesthesia and you can expect tape and a cast over your nose for the first week following surgery. The majority of patients do not experience any significant pain, however, analgesic medications can be given as needed for post operative discomfort. Your face will feel puffy, especially the first day after surgery and some patients experience brusing around the eyes especially if their nasal bones were broken as part of the surgery. The cast and dressing is typically removed after a week. Swelling is to be expected though it varies from individual to individual. This swelling typically largely resolves within weeks with the remaining swelling gradually disappearing up to a year after surgery. Good health and realistic expectations are the key factors that make one suitable for rhinoplasty. Having a good idea of the problems you have with your nose and the desired outcome helps in a more directed and fruitful consultation. A good balance must be struck between the function and the appearance of the nose. Harmony between the nose and the rest of your features is essential and it would be unwise to take a “cookie-cutter” approach in determining the type of nose you would like. At the end of the day, the nose should blend with the rest of your face and should not be the “highlight” of your face. Following surgery, its essential to complete the medications prescribed to you. Typically, these are antibiotics, anti-bruising medications and nasal sprays. Avoid getting any dressings and the nasal cast wet and try to stay indoors in the initial week. Keeping the head elevated aids in reducing postnasal drip and swelling around the nose. Attend your postoperative visits regularly so the wounds and nasal passages can be taken care of during those visits. Spicy foods, hot foods, alcohol, smoking and vigorous exercise should be avoided for the first 2 weeks. Subsequently, you may return to your usual lifestyle gradually. Most importantly, have adequate rest and eat well so that recovery will be optimal. Post rhinoplasty patients should avoid sun exposure for the first 6 weeks or wear good sunblock to avoid hyperpigmentation over the operated area. Do not wear glasses with rests that lie over your nose bridge so as to avoid pressure points developing over the nose bridge. Otolaryngologists are trained to assess the internal aspects of the nose and manage all (medical) aspects of nasal conditions such as nasal polyps, sinusitis, allergies, deviated nasal septum and turbinate enlargement. Singapore ENT specialists who are trained in Facial plastic surgery would in addition be able to analyze and develop the ideal surgical plan to obtain an ideal outward appearance while addressing the functional (medical) aspects of the patient’s nose. It is therefore important to appreciate the approach ENT-Facial Plastic surgeons’ approach to rhinoplasty, which may be very different from just an outward correction of nasal aesthetics. With proper analysis, realistic patient expectations and the skills of a qualified facial plastic surgeon, rhinoplasty is a very rewarding procedure for both patient and surgeon alike. Rhinoplasty being one of the most difficult operations to perform means that rigorous training and experience would make a difference in your final outcome. In Singapore, only certain specialists are accredited by the Ministry of Health to perform this operation. Specialists who specialize in rhinoplasty would typically spend a year overseas honing their skillset with this type of surgery since the training opportunities in Singapore to learn rhinoplasty can be rather limited. With all these in mind, it would be pertinent to look out for a surgeon with these requisite credentials and training. At Ear Nose Throat, Head & Neck Surgery, surgeons in our Singapore ENT clinic are fully accredited ENT specialist with the Ministry of Health, Singapore. Additionally, Dr Kenneth Oo is on the select list of ENT specialists who is accredited to perform Facial Plastic procedures. Dr Oo spent a year at the University of Virginia, USA subspecializing in Facial Plastic Surgery and Rhinoplasty under world-renowned mentor Professor Stephen Park. He was also attached to Seoul National University under the guidance of Professor Hong Ryul Jin for a stint to refine his approach to Asian rhinoplasty. Dr Oo has also been the course director of the Rhinoplasty course at the Singapore General Hospital since 2010 and has co-written a Rhinoplasty dissection manual. He continues to be invited to share his experience with rhinoplasty in the region as well as internationally. At Ear Nose Throat, Head & Neck Surgery, you can therefore be assured that the ENT doctor performing your rhinoplasty has the credentials and experience to produce the results that’s the best for you.